These are the highest honors bestowed by CALS. The Honorary Recognition Award, established in 1909, recognizes individuals who have made significant contributions to their professions, their communities and the university. Roger Blobaum, an agricultural consultant, has been a leader in organic farming research, education, advocacy and policymaking since the early 1970s. He has served on boards of more than 30 regional, national and international organic and sustainable agriculture organizations, including Midwest Organic and Sustainable Education Service (MOSES). 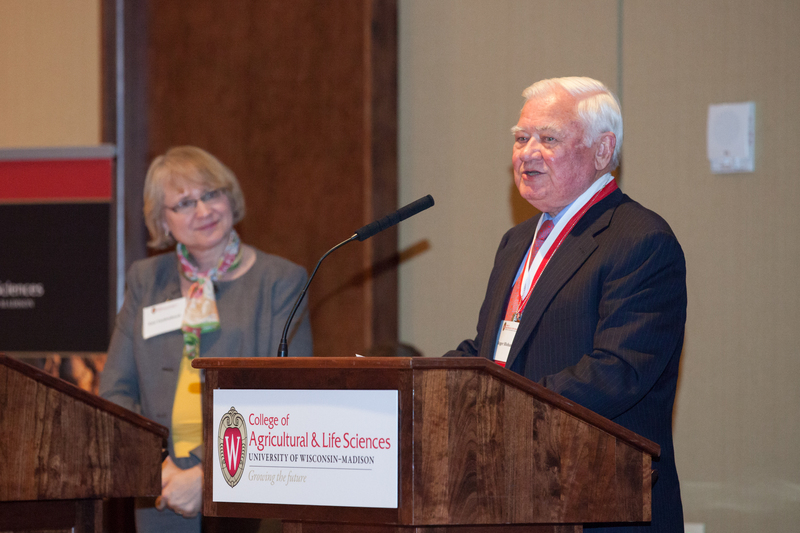 His contribution to MOSES includes developing the Organic University, which provides short courses to more than 500 participants annually, and the MOSES farmer-to-farmer mentoring program. He was a founding director of the International Organic Accreditation Service, a founder and associate director of the World Sustainable Agriculture Association, and a participant in the 5-year process of setting international organic guidelines. He co-chaired a coalition of national organizations that helped shape the 1990 Organic Foods Production Act and that successfully advocated its enactment. His organic research contributions include developing and coordinating Ceres Trust programs that have awarded more than $6 million in grants to land grant university faculty and graduate student researchers.